We service Apple, Dell, HP, Samsung, and all major brands of PC and Laptops in our Willimantic, Connecticut facility. No appointment is needed, walk-ins are always welcome. Using both our state of the art diagnostic tools & and experience we will figure out what is going on with your machine. We repair even the toughest and most delicate of repairs including hinge repair, frame damage, touchscreen and digitizer replacement, and solder repairs. Most diagnostics are done within 24 hours. We will explain to you what the issues are how much it will cost to fix your machine before the work is performed. PC just not running right? Slow response times? Your machine just might be in need of a tune up. Getting pop-ups? Applications starting up that you had no knowledge of installing? You may be infected with spyware. Detect & remove all occurrences of spyware & virus infections on your machine. 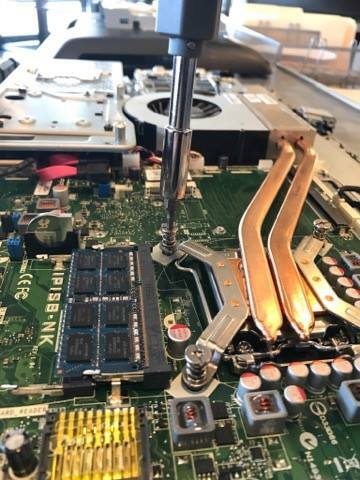 Whether your machine needs hardware replaced in order to work properly or if you are looking to boost the performance of your machine we can perform the necessary hardware replacements to make it happen. Reinstalling an Operating System resolves many software issues that are created over time. We recommend this every few years or if a machine is so badly infected with viruses that our standard virus removal package doesn’t resolve. Back up of data (Pictures, Documents & Files) from your existing Desktop / Laptop Operating System. All solder work is performed in – house.